I naively obtained this large, beautiful book thinking I was going to read a story of the Earth’s history. In fact, it is – probably more usefully – a story of methods and measurements. 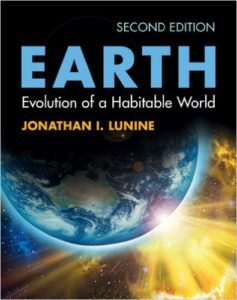 We begin with the basics of the Earth in space, the scale of the universe, magnetism and light: with every step, Lunine takes us through how we know about each of these, who discovered them and when. We go on to use science from many different disciplines to study Earth’s history: the atomic structures of amino acids; radioactivity and isotopes; the histories of other planets and moons in the Solar System; plate tectonics and geology. Each chapter begins with a simply written introduction and ends with a summary and many references. The chapters each contain several short sections, so it is easy to find what you are looking for. I marvelled at the huge scope of science, and the amount of integration of different fields that astrobiologists have achieved. This book would be extremely useful to anyone with gaps in their astrobiology knowledge; if the book does not completely fill them, it will certainly point you to other sources that can. My only problem with the book was not feeling any sense of narrative. After working my way through many chapters, and feeling overwhelmed at the amount of information I had absorbed, I reached chapters whose names suggested we would reach some reconstructions of an earlier Earth – but instead, I was met with even more methods and measurements! This may of course not be at all a problem for others, but I do not recommend this book for bedtime reading. It is to be absorbed slowly, not necessarily in chronological order. It is a mine of treasure in references and scientific leads, and it also highlights areas that are not yet fully understood, where more research can be undertaken. I definitely recommend it to all who want to know more about how we can study astrobiology, and also to the nonmathematical, for while we do meet a few equations and methods, they are kept as simple as possible. I would not recommend this as a first introduction to astrobiology or to those with very little scientific background; it is quite daunting, but definitely worth the effort.